Android & iOS systems are obviously the best mobile operating-systems for smartphone till now. It is easy to use therefore it is widely used systems at the moment. But wait, your mobile phone keeps rebooting & you don’t even know what to do. It supposed to be work anyhow, at least, it would be acceptable if there was a single reason or cause that tells why the phone keeps restarting randomly, but there is no quick solution that fixes it asap. 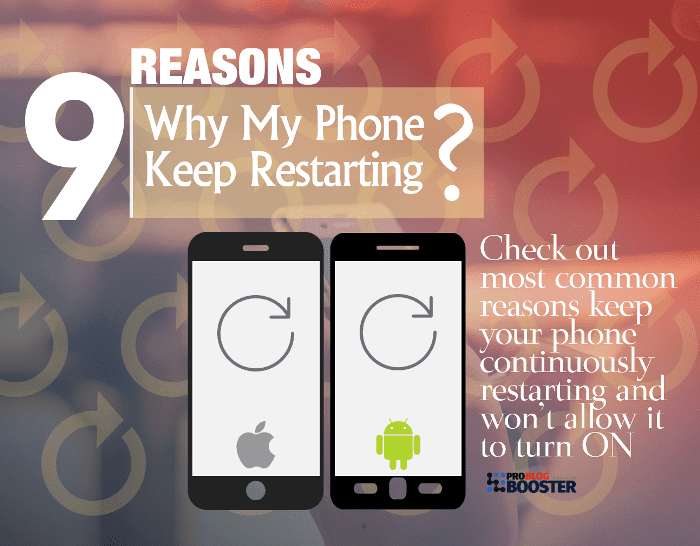 So on this page, I'm going to discuss what are the most causing reasons making your phone keep rebooting and won't allow starting again. I’ll also be going to explain the possible solutions on how to fix the restarting problem of your Android/iOS phone. Users used to search; Why does my phone keep restarting itself? Why does my iPhone keep restarting on its own? Why is my phone turning on and off by itself? how to stop your iPhone X restarting itself? Why does my Samsung phone restart over and over again? If your iPhone keeps restarting over and over again on iOS 10/11/12, then here I'm going to explain some quick suggestions to fix the iPhone X/8/7/6s/6 keeps restarting again & again problem. Android (operating system) is a Linux based open source operating system specially designed for screen touch devices like tablets, computer, smartphones etc. Like all other systems, after some period of time, the version needs to be updated. That is the reason, there are so many versions of Android OS available from cupcake to latest marshmallow. While updating and operating these updated devices and its functions, many times it is noticed that they come across many issues & the most familiar of them is "Android phones reboot automatically". So in this post, you will see why such problem occurs & how to get rid of it. It looks great when your mobile devices work well in a way you want but it makes you frustrated when it creates randomly phone rebooting issues like this. These frustrating things create a doubt in mind about the device even though the Android operating or latest iOS system is a pleasure to use. The feeling is like a fired of the device. I would like to mention here that, this is not a big problem at all although it has to sort out ASAP to enjoy the greatness of the device. So let's see the reasons behind it and quick solution to fix the restarting issues of phones. All of a sudden yesterday, my iPhone X restarted and it only stuck at the Apple logo screen, then restarted again. It goes, again and again for every 20sec, only one thing I could do was put it switched off completely. Similarly, 2-3 months back, when I was using Android, I got to fall in the same situation, it was also struck in the same situation and keep restarting. But this time it happens with iPhone and I thought to find the reasons for restarting loop of phones and share the solutions to fix the repeatedly restarting issues of mobile phones. One of the most causing reason is corrupted data found on the phone. Having a different OS software in earlier operating systems may corrupt the existing files on your device. To fix this problem and avoid data corruption you just require to reboot your device regularly. Once you install the latest software updates on Android or iOS, I would suggest you restart it compulsory once the update process is completed. Few third-party apps tend to crash as they are unsuitable for the new software versions since it is used and best suitable for certain versions by the manufacturers to enhance the quality of their operating system and its functions. As a result of mismatching OS versions to the applications, certain apps will stop the device functioning, and cause the normal reboot process. To fix this problem you can reboot the device in safe mode. Android Safe Mode: Press and hold the power button >> you get the menu list >> now press and hold the POWER option on the screen >> it will ask to restart the phone in safe mode. iPhone Safe Mode: Press and hold the power+home button >> once you get the apple logo >> press and hold the VOLUME UP button >> it will take time, and your iPhone starts in safe mode. In safe mode, just remove the unwanted or unsuitable apps or most recent apps those causing the phone freezing. You might have seen the word "clear cache". A cache is a place where something is stored temporarily while running the application. This has a noticeable effect on rebooting automatically. This can be fixed by clearing the cache. Clearing junk files, memory hogs and deleting unwanted cache is one of the best ways to give your phone a fresh start to speed up the phone functions. Also, help with closing all background running apps at once, and avoid freezing, lockups, and other hanging up issues. Poor quality or less secure apps can also be a reason for the auto reboot. Be sure to use default and uninstall the apps usually you don't use. Disable access to these less secure apps. The apps you use should be genuine & useful and downloaded from authorized app store, especially the apps you use for email & text messaging. Sometimes receiving a message on those insecure apps can cause an auto reboot. So switching to the genuine and default apps can fix the unwanted issues. Some of you may notice those flagged apps keep running in the background and it can also be cause for an auto reboot without your permissions. Uninstall the apps you don't really require. Make sure you have the latest version of apps. Go to play store and update all apps you need. Make sure to download from authorized app store, and install any app from secure, authenticated websites. In Play Store app you can activate the "Play Protect" function to scan you installed apps automatically. On some occasions user want to change the operating system, it causes the possibilities of the Android/iOS firmware software corrupt. Trying another version of ROM or in alliance with other compatible ROM can fix this issue only if you really wanted to use a custom Android ROM. If you are not willing to change the OS, and still facing the restarting loop issue, then I must say, you have to go for factory data reset. Stock ROM is a unique development by mobile system providers to make their graphical interface look different & unique from others. Sometimes the automatically rebooting issues may be found with pre-built or pre-boot features by default OS provider. This includes At & t, Verizon, Fido which may become a reason for your Android phone to reboot automatically. Such cases tend to found mostly with some Samsung Galaxy phones on which Stock ROM'S are pre-installed OS. Restart your phone in downloading mode, and clear the data and cache. It will not only clear the apps but also the default settings - its called HARD RESET. Sometimes you may face some apps, games & software are updated automatically. Even more, you have installed the most updated version, that may cause your app to be incompatible with the updates being installed. And this may create troubles for the apps in communicating with your software to function it properly. As I noticed, this generally happens with Gmail updates & pre-installed apps. Same also applied to the case of auto syncing the contacts. Samsung Galaxy S4 offers a 1.6 GHz CPU. Over the counter, this looks so good, but many times this high CPU frequency can be a reason for an Android phone to reboot automatically (Unfortunately, TouchWiz Home Has stopped.). You can still face accidental shutting down/restarting problem due to the high CPU frequency allotted to the process. This tends to happen with most of the newly bought high CPU frequency mobiles even when there is no app downloaded & widget being installed. Generally, people seem to ignore the notification to update apps & that also may cause your Android phone to reboot automatically. Some of the old Android phones don't have the option to get updated to the latest Android version. But for now, you can check if there is an update available. If it is you can install it to keep your phone up to date. I hope today I tried to fix the restarting problem causing your phone randomly shutting down and restart continuously. If you have any other method and want to share some ideas or to give feedback you can tell via comment section shown below. If you feel this page help you little, then don't forget to hit the like, share button. Also requesting you to subscribe to get the tech updates on your mail directly.